On the occasion of 150 years since the eruption of the volcano in Santorini (1866), various events are planned this year to celebrate the anniversary. One of the most important events is the international scientific conference “NEMO 2016: 150 Years of study of Santorini volcano”, which will take place at the Congress Centre “Peter M.Nomikos”, November 3-5, in Santorini. Honorary President of the conference is the Director of the Excavations of Akrotiri Thera, Professor Christos Doumas. Presidents of the Commission’s Programme of the conference is the volcanologist George Vougioukalakis and the Professor of History Iris Tzachili, who will describe the socio-political context in which the explosion of 1866 occurred and how Santorini and Therasia were in the center of attention of geological, archaeological, paleontological, historical and social sciences of the time. The conference is named after the famous French novelist Jules Verne’s hero “Captain Nemo”, referred to as a scientific genius who hangs around in the depths of the sea in the “Nautilus”, his submarine. Jules Verne had arrived, among other foreigners, at Santorini to watch the volcano’s activity during the years 1866-1870. His experiences on the island, seem to have been the source of inspiration for future novels, the “20,000 Leagues Under the Sea” (1870) and “The Mysterious Island” (1874). In the photo, the man is sitting on the coast of Nea Kameni. 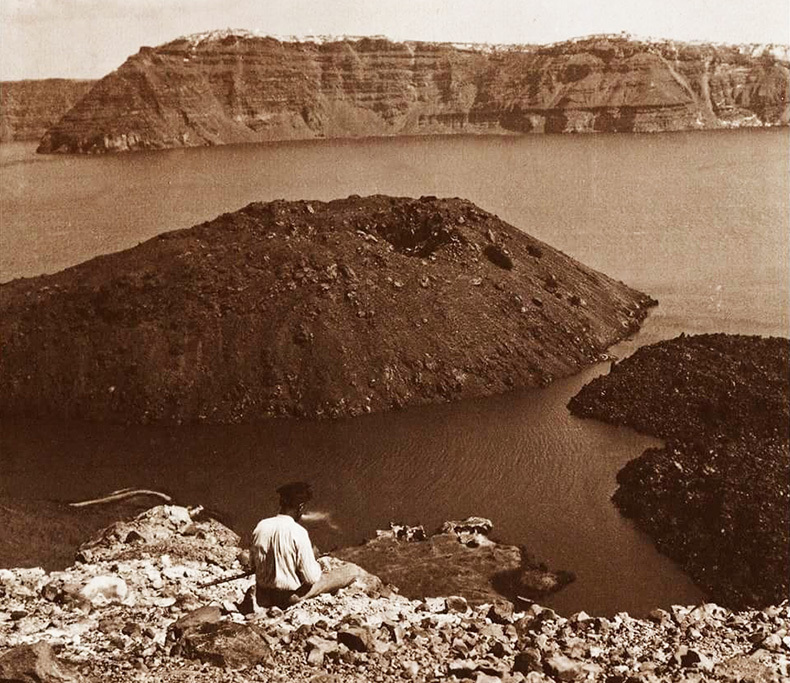 The island of Small Kameni which is in front of him does not exist today, as it was covered by lava of the eruption in 1925 (photo taken in 1905).